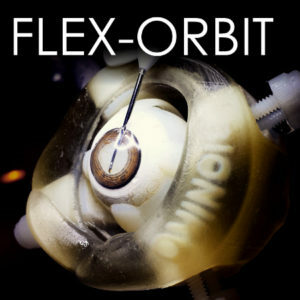 The FLEX-ORBIT is a universal eye-holder, compatible with BIONIKO synthetic models and ex-vivo biological tissue. It provides the user with a compact yet realistic frame of reference, including anatomical landmarks such as the brow and eye movement simulation that provide an added challenge. This platform is ideal for use in the wet-lab, research lab, and tradeshow floor to communicate with colleagues, patients and clients.